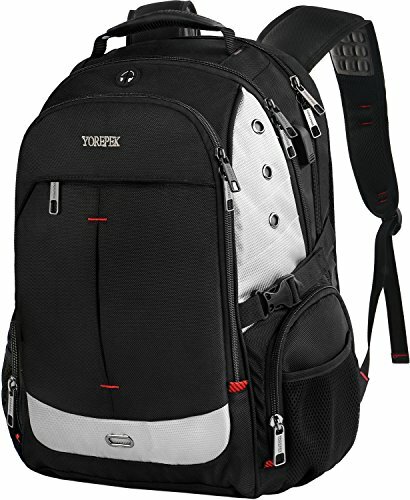 Large Laptop Backpack,Extra Large Travel Laptop Backpacks with USB Charging Port for Men&Women,TSA Friendly Water Resistant Big Business College School Computer Bookbag Fit 17-Inch Notebook,Black | Replicafer Co. If you have any problem with our products and service, please contact us immediately, we will reply you within 24 hours.Sophia shop provide you with reasonable price,good quality backpack,excellent customer service and one year limited warranty. ❤TSA FRIENDLY & CONVENIENT: The large travel backpack's scanSmart lay-flat technology exclusively designed for AIRPLANE INTERNATIONAL TRAVEL,Unfolds freely 90-180 degree,keeping above and below the laptop section clear, making you quickly go through the airport security and keep other items tidy.A large capacity functional traveling backpack for boys,girls,students,teens,adults,women and men,Great gifts for Back to School Season.